Millions of Specially-Abled who are physically unique require a prosthetic limb as wheelchairs are expensive and can be difficult to use when roads are potholed, streets are muddy, pavements are nonexistent, and buildings / structures are not per accessibility code. They thus struggle in their daily activities of living, and above all, in work. This casts them back onto their families and communities, further exponentially escalating the endless cycle of any hardship and poverty. The World Health Organization estimates that 30 million require prosthetic limbs, but only 20% have them. Prosthetics can involve a lot of work and expertise to produce and fit, and per WHO, there is a huge deficit in trained prosthetists in developing countries. Time and financial cost in traveling long distances for treatment, further exacerbates an already fragile human condition. Consequently, braces and artificial limbs are among the most desperately needed medical devices. 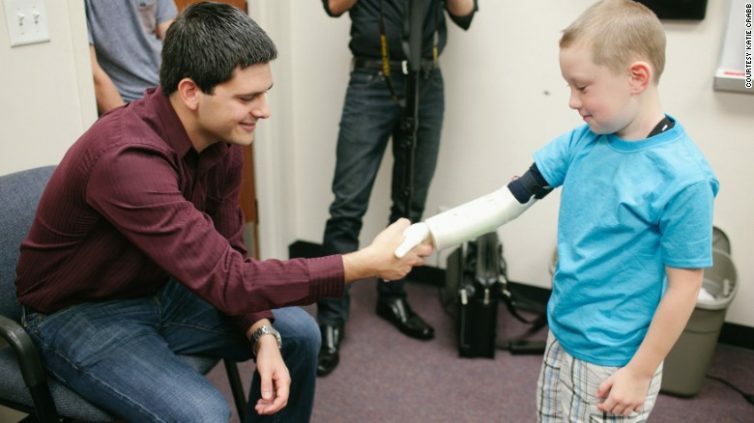 Fortuitously, engineering has come to the rescue in the form of 3D printed prosthetics! Since the turn of the century, 3D printing has already revolutionized areas of medicine: 3D-printed skin for burn victims, airway splints for infants, facial reconstruction parts for cancer patients, orthopedic implants, etc. This 3D prototyping has now created millions of customized hearing-aid shells and ear molds, and also replaced the centuries old wax / clay models for dental crowns and bridges by converting dental scans into printed prosthetics. 3D printed prosthetics technology makes practical and economic sense and is a beacon for physically-challenged people: commercially-manufactured prosthetics typically cost between Rs 3 lakhs to Rs 35 lakhs, while also taking months to create, that in the end, multitudes of challenged folks can’t afford; however, a 3-D printed prosthetic would cost only a fraction at Rs. 3,000 and produced in a day – currently, numerous companies and organizations offer these prosthetics at very minimal or no cost. Furthermore, they are easily customizable without costing a fortune and also replaced without being a burden to families as children outgrow their prosthetic—newer stretchable / expandable ones on the horizon could actually grow with the child! Lastly, 3D printed prosthetics trump traditional ones in their comfort and superior-high quality. Astoundingly, people who do not even have a printer can easily obtain a functioning hand prosthetic within 24 hours for about Rs. 700: at the open source site of Cyborg beasts, http://www.cyborgbeast.org/#/, the hand prosthetic design has been downloaded 48,000 times! This rapid prototyping leverages off of the model of low cost, open source, and collaborative ability to develop a prosthetic design any place in the global community, email it to those who request, and instantly printing it, thus galvanizing a whole new world of possibilities. http://enablingthefuture.org/ – A charity which has thousands of volunteers across the world who help design and print open-source prosthetic hands, below elbow and wrist. http://www.openhandproject.org / and https://www.openbionics.com/ – Open Hand Project is a charity which is supported by Open Bionics, a company that makes 3D printed hand prosthetics. http://protosthetics.com/ – A commercial manufacturer of 3D printers specifically suitable for leg prosthetics. https://www.createoandp.com/ – A company providing prosthetic scanning/printing machines for medical practitioners. http://www.openbiomedical.org/ – A non-profit organization which develops and distributes health and accessibility supports, including hand and leg prosthetics by 3D printing. Everyone is encouraged to get involved in this revolution by: Partnering with any of the organizations listed above; Meeting with a group to learn about the latest developments and help to spread the word; Joining an online forum/discussion group; Donating to such charities; Purchasing a 3D printer and give others the gift of a limb: http://3d-printers.toptenreviews.com/; Spreading the word on social media about the affordability and ease of this technology; Sharing of personal stories; Those with an engineering or design background can join the open-source community to further develop prosthetic prototypes, or offer advice for new designs. In a world where accidents, conflicts, degenerative disorders, or genetics create physical challenges, an amazing technology has ignited a tangible expectation that helps the Specially-Abled in turning their dreams into reality: 3D printing of prosthetics! The avenue of awareness and accessibility to this technology, also a major cornerstone of the mission of VoSAP, will surely need to be rapidly explored and implemented for our communities.